WINNIPEG, MB – Just over a year after debuting a couple of contract-brewed brands at the 2016 edition of the Flatlander’s Beer Festival, One Great City Brewing has officially opened its doors in Winnipeg. Founded by partners Jon Burge and Tim Hudek, with Josh Berscheid (ex-Half Pints) on board as head brewer, One Great City takes its name from a former city slogan of Winnipeg. 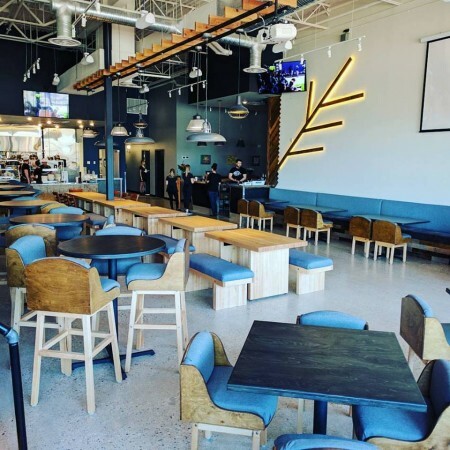 Following a soft opening last week, the brewpub is now open for full service, and is offering several in-house beers developed by Berscheid – including Monkey Trail Pale Ale, Belgian Esprit Wit, Queen’s Best Bitter, and Tipsy Cow Milk Stout – alongside guest taps from other local breweries. The food menu overseen by Burge – who is a trained fine dining chef – is focused on high quality versions of pub favourites including chicken wings, sandwiches, burgers, and fish & chips, all prepared from scratch with as many locally sourced ingredients as possible. One Great City is located at 1596 Ness Avenue in Winnipeg, and is open from 4:00 PM to 12:00 midnight daily, with the kitchen open from 5:00 to 11:00 PM. For more details, see the One Great City Facebook page.